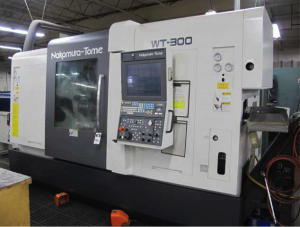 OCT/2012 Nakamura – Tome WT-300 8-Axis CNC Turning / Milling Center s/n M303606 w/ Nakamura – Tome Controls, Renishaw HPRA High Precision Removable Arm Tool Presetter with Dual Probe Heads, 2.56” Thru Main Spindle, 4500 Main and Sub Spindle RPM, (15) Axial and Radial Live Tooling, Synchronized Spindles, 0.001 Degree C-Axis Main and Sub Spindle Programming, Simultaneous 4-Axis X-Z-Y-C Machining, Upper and Lower 12/24-Station Dodecagonal Turrets with 3600 Rotary RPM, 10.63” Max Turning Diameter, 30.71” Max Turning Length, 8” 3-Jaw Power Chucks on Main and Sub Spindles, Hainbuch/MicroCentric 100BZ/HSW100 Colleted Main Spindle Nose, Parts Catcher with Conveyor Out Feed, LNS Turbo-HB Chip Conveyor, Chip Blaster mdl. GV2-80 High Pressure / High Volume Coolant and Filtration System with Chip Chiller High Performance Cooling System and Mist Blaster Mist Collection System, Edge Technologies “Rebel 102 Servo SE” Automatic Bar Loader / Feeder s/n T12012401114. 2006 Haas SL-20TB “Big Bore” CNC Turning Center s/n 3075522 w/ Haas Controls, 3” Thru Spindle Bore, 30Hp Vector Dual Drive, Tool Presetter, 10-Station Turret, Hydraulic Tailstock, 4000 Max RPM, Rigid Tapping, M19 Spindle Orientation P & R Codes, 10mm Ball Screws, Quick Code, Chip Auger, Parts Catcher, 10” 3-Jaw Power Chuck, Coolant. 2006 Haas Servo Bar 300 Automatic Bar Loader / Feeder s/n 92029. Nakamura – Tome TW-20 Twin Spindle – Live Turret CNC Turning / Milling Center w/Nakamura-Tome LUCK-BEI Controls, 50-5000 RPM Main and Sub Spindles, 48-3600 Rotary Turret RPM, (2) 12-Station Live Turrets, 2” Thru Spindle Bores, 10.63” Max Turn Diameter, 7.56” Max Turn Length, 0.001 Degree Incremental C-Axis Programming, Simultaneous 3-Axis Cutting, Parts Catcher, Coolant. 1995 Fuji “NC Robocell” TN-25TL CNC Robotic Turning Center s/n 10867 w/ Fanuc Series 0-T Controls, 8-Station Turret, 20-Station Robotic Loading Cell w/ FCS-0B Hand Held Controller, 4000 Max RPM, Travels X= 9.05”, Z=12.59”, 8” 3-Jaw Power Chuck, Chip Conveyor, Coolant. 1993 Hardinge Conquest-42SP Twin Spindle CNC Turning Center s/n SG-275 w/ Fanuc Series 18-T Controls, 12-Station Turret, 16C Main Spindle @ 5000 Max RPM, 16C Sub-Spindle @ 6000 Max RPM, 10Hp Motor, Parts Catcher, Turbo Chip Conveyor, Coolant, Sameca Type QS-7.52 Hydraulic Bar Feed s/n 3/655. Hardinge Conquest-42 CNC Turning Center s/n CS-189 w/ Fanuc 0T Controls, Tool Presetter, 12-Station Turret, 5000 Max RPM, Tailstock, 16C Spindle, Turbo Chip Conveyor, Coolant, Sameca Type QS-4 Hydraulic Bar Feed s/n 143. Mori Seiki SL-3HS CNC Turning Center s/n 5164 w/ Fanuc 0T Controls, 10-Station Turret, Hydraulic Tailstock, 4000 Max RPM, 10Hp Motor, 15.75” Max Swing, Travels X=603”, Z=21065”10” 3-Jaw Power Chuck, Coolant. Mori Seiki SL-3H CNC Turning Center s/n 4748 w/ Yasnac MYNC-L1 Controls, 10-Station Turret, 4000 Max RPM, 10Hp Motor, Hydraulic Tailstock, 15.75” Max Swing, Travels X=6.3”, Z=21.65”, 10” 3-Jaw Power Chuck, Coolant. 2010 Yama Seiki “Super BM-1600” CNC Vertical Machining Center s/n 10037 w/ Fanuc Series 18i-MB Controls, 40-Station ATC, CAT-50 Taper Spindle, 6000 Max RPM, Rigid Tapping, Dual Chip Augers, Chip Conveyor, Losma “Darwin 3000” Mist Collector, Harbor Oil Cooler, High Flow Coolant System, 31 ½” x 67” Table. 1994 Kitamura Mycenter-H400 4-Axis 2-Pallet CNC Horizontal Machining Center s/n 42106 w/ Fanuc Series 15-M Controls, 100-Station ATC, CAT-40 Taper Spindle, 10,000 RPM, 10Hp Motor, 4th Axis Thru Pallets, (2) 15 ¾” x 15 ¾” Pallets, Travels X=24.4”, Y=20.8”, Z=20.8”, Daikin Oil Cooler, Chip Conveyor, Coolant. 1990 Kitamura Mycenter-H300 4-Axis 2-Pallet CNC Horizontal Machining Center s/n 40454 w/ Fanuc Series 15-M Controls, 100-Station ATC, CAT-40 Taper Spindle, 10,000 RPM, 7.5Hp Motor, 4th Axis Thru Pallets, (2) 12” x 12” Pallets, Travels X=15.75”, Y=19.7”, Z=15.75”, Daikin Oil Cooler, Dual Chip Augers, Chip Conveyor, High Flow Coolant System. 1993 Fadal VMC6030HT CNC Vertical Machining Center s/n 9304188 w/ Fadal CNC 88HS Controls, 21-Station ATC, CAT-40 Taper Spindle, 10,000 RPM, 14.4Hp Motor, Travels X=60”, Y=30”, Z=30”, Fadal Hydro Sweep Chip Removal System, 30” x 62 ½” Table, Coolant. 1991 Kitamura Mycenter-3 APC 2-Pallet CNC Vertical Machining Center s/n 20813 w/ Fanuc Series 0-M Controls, 30-Station AC, CAT-40 Taper Spindle, 6000 Max RPM, 10Hp Motor, (2) 16 ½” x 39 ½” Pallet Tables, Travels X=33”, Y=18.89”, Z=18”, Daikin Oil Cooler, Turbo Chip Conveyor, Coolant. 1991 Kitamura Mucenter-2 CNC Vertical Machining Center s/n 11170 w/ Fanuc Series 0-M Controls, 20-Station ATC, CAT-40 Taper Spindle, 7000 Max RPM, 10Hp Motor, Travels X= 23”, Y=17”, Z=18”, Daikin Oil Cooler, 16” x 36” Table, Coolant. 1991 Kitamura Mycenter-1 CNC Vertical Machining Center s/n 02418 w/ Fanuc Series 0-m Controls, 20-Station ATC, BT-35 Taper Spindle, 10,000 RPM, 7.5Hp Motor, Travels X=20”, Y=14”, X=16”, Daikin Oil Cooler, 14” x 31” Table, Coolant. 1991 Kitamura Mycenter-1 CNC Vertical Machining Center s/n 02417 w/ Fanuc Series 0-m Controls, 20-Station ATC, BT-35 Taper Spindle, 10,000 RPM, 7.5Hp Motor, Travels X=20”, Y=14”, X=16”, Daikin Oil Cooler, 14” x 31” Table, Coolant. 1991 Kitamura Mycenter-1 CNC Vertical Machining Center s/n 02395 w/ Fanuc Series 0-m Controls, 20-Station ATC, BT-35 Taper Spindle, 10,000 RPM, 7.5Hp Motor, Travels X=20”, Y=14”, X=16”, Daikin Oil Cooler, 14” x 31” Table, Coolant. 1991 Kitamura Mycenter-1 CNC Vertical Machining Center s/n 02394 w/ Fanuc Series 0-m Controls, 20-Station ATC, BT-35 Taper Spindle, 10,000 RPM, 7.5Hp Motor, Travels X=20”, Y=14”, X=16”, Daikin Oil Cooler, 14” x 31” Table, Coolant. 1991 Kitamura Mycenter-1 CNC Vertical Machining Center s/n 02370 w/ Fanuc Series 0-m Controls, 20-Station ATC, BT-35 Taper Spindle, 10,000 RPM, 7.5Hp Motor, Travels X=20”, Y=14”, X=16”, Daikin Oil Cooler, 14” x 31” Table, Coolant. 1991 Kitamura Mycenter-1 CNC Vertical Machining Center s/n 02342 w/ Fanuc Series 0-m Controls, 20-Station ATC, BT-35 Taper Spindle, 10,000 RPM, 7.5Hp Motor, Travels X=20”, Y=14”, X=16”, Daikin Oil Cooler, 14” x 31” Table, Coolant. 2004 Flow mdl. 712127-1 CNC Water Jet Contour Cutting Machine s/n 299320 w/ 60,000 PSI Intensifier System, Flow / Morfab Garnet Tank, Barton 4400 Lb Cap Elevated Garnet Hopper, 80” x 160” Work Area, FlowCUT Software System and Computer. 1994 Kent KLS2080 Geared Head Gap Bed Lathe s/n J10997 w/ Newall Topaz DRO, 12-1680 RPM, Inch/mm Threading, Tailstock, 12” 3-Jaw Chuck, 12” 4-Jaw Chuck, 19” Faceplate. ZBFS mdl. 6T83W-1 Universal Power Mill s/n 158 w/ 40-1600 Dial Horizontal RPM, 50-Taper Horizontal Spindle, 50-1600 RPM on Upper Arm with 50-Taper Spindle, Universal Milling Head with 40-Taper Spindle, mdl. 695 90mm Universal Shaping Attachment s/n 15, Power Feeds, Box Ways, 15 ¾” x 67” Table, Coolant. Clausing / Kondia mdl. FV-1 Vertical Mill s/n X-877 w/ Sony Millman DRO, 3Hp Motor, 60- 4000 Dial Change RPM, Kurt Power Draw-Bar, Chrome Ways, Power Feed, 9” x 48” Table. Clausing / Kondia mdl. FV-1 Vertical Mill s/n X-876 w/ Sony Millman DRO, 3Hp Motor, 60- 4000 Dial Change RPM, Kurt Power Draw-Bar, Chrome Ways, Power Feed, 9” x 48” Table. Clausing / Kondia mdl. FV-1 Vertical Mill s/n Y-568 w/ Sony Millman DRO, 3Hp Motor, 60-4000 Dial Change RPM, Kurt Power Draw-Bar, Chrome Ways, Power Feed, 9” x 48” Table. Clausing / Kondia mdl. FV-1 Vertical Mill s/n Y-427 w/ 3Hp Motor, 60-4000 Dial Change RPM, Chrome Ways, Power Feed, 9” x 48” Table. Amada HA-250 10” Automatic Hydraulic Horizontal Band Saw s/n 459797 w/ Amada Controls, Hydraulic Clamping and Feeds, Conveyor, Coolant. DoAll mdl. 1612U 16” Vertical Band Saw s/n 146-591175 w/ Blade Welder. DoAll mdl. MI 16” Vertical Band Saw w/ Blade Welder. Lux Saw mdl. LUXSAW10H 10” Horizontal Band Saw s/n 10057 w/ Manual Clamping, Dial Feed. Lown mdl. B400 38” Power Roll w/ 4” Rolls. DiAcro Brake No. 1 24” Hand Press Brake w/ 6” Throat, Stand. DiAcro No. 24 24” Finger Brake s/n 1-1657 w/ Stand. Power Drill w/ 5.4Hp Motor, Auto Feeds, 19 ¾” x 19 ½” Table. Clausing 4-Head Gang Drill Press w/ mdl. 1639 5-Speed Drill Heads, 20” x 60” Table. Central Pneumatics Sand Blasting Pot. Bevel-Mill mdl. VA-400 Corner Beveling Machine. Miller 330A/BPLA CC-AC/DC Arc Welding Power Source s/n JH196646 w/ Bernard Cooler and Cart. Thermal Dynamics ThermalArc PAK10XR Plasma Cutting System.